Are you looking for gift wrapping ideas for kids birthday or Christmas gifts? We've got some neat ideas that will save you money, are green and will impress the kids. A few years ago I stopped using gift wrapping paper when my supplies ran out. Why? Well it's expensive to buy and not very environmentally friendly. It seems like a big waste for just a few seconds of unwrapping. Also my children were small and wrapping paper with sticky tape is very frustrating for a small child who is eager to get at their goodies! In this article we'll look at what we've been using as an alternative to gift wrap. This is probably my favorite option: flags. We often use flags to wrap up the kids birthday and Christmas gifts. You can see my son's pile of third birthday gifts to the right, wrapped up in England flags and a Pirate Flag. Usually we just wrap the items up and tuck the excess flag underneath. We have used a small piece of low-tack tape to hold the flags together when needed. And you can use multiple flags for bigger items. For younger children it may be worth placing gifts in a bag (see below) and handing them out one at a time so they don't just pull all the flags off at once. But we've found that our kids have been happy to be passed one gift at a time, and pleased to be able to get at their gift quickly. 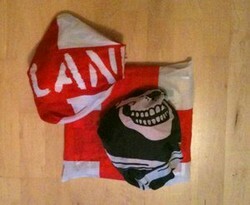 The flags are used for role play in between gift-giving occassions so we really get our money's worth from them! And it's a relief not to have to worry about remembering to buy gift wrap too. I just grab the flags from the dress up box and I'm done wrapping in a couple of minutes. We also have reusable gift bags that we use for birthdays and Christmas. They are part of the tradition. The kids keep their gifts in the larger gift bags for a few days so they can show them to visitors before they get put away in their new locations. This keeps the new toys together in one place. The gift bags easily store away until the next occassion. Pop them in a closet or under the bed. Would you use reusable gift wrap? 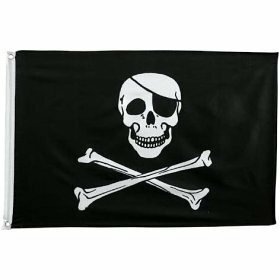 Make your own pirate party picks, flags and decorations to print out and assemble. And a selection of pirate party supplies to buy too. Lots of ideas for your craft box. My kids love making and craft activities. Our collection of kids craft supplies comes in very handy when they want to make something. Will you use reusable gift wrap? I have a friend who is very crafty. She uses fabric gift bags that she sewed herself. I think that is so smart! Children love soft plush toys like stuffed dolls, and with the success of the Disney movie Frozen, Elsa and Anna dolls have become the perfect birthday gifts for young girls.